D-ring on the front panel allows adding any attachments. Takes quite a lot of space on the shelf. This roomy and reliable workout gym bag boasts a great variety of exterior pockets for all essentials and sports gear. It is perfect not only for a gym but for small trips as well. Front pocket provides vertical bottle arrangement; you can always drink some water if you wish to. A solid compact bag that is ideal for a gym workout. Owing to the dark coloring, it can be used intensively without constant washings. Great buy for enthusiastic athletes! Travel Inspira is a durable and fairly big bag, which is surprisingly lightweight. Foldable design is a real space-saver. 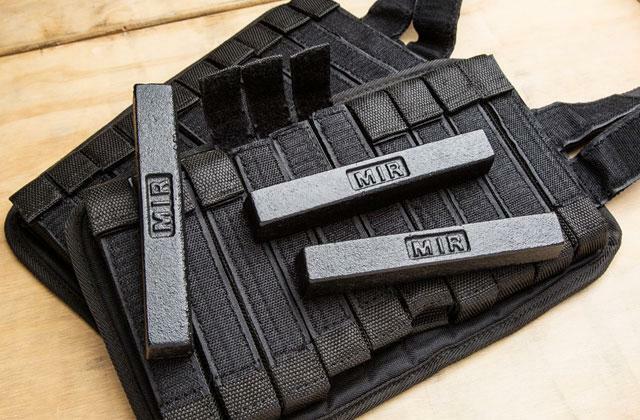 Despite being ultra-lightweight, this bag is super strong. It can be folded to 2" x 4.9" for easy storage. Great not only for a gym but also for traveling and cycling! Climaproof bottom will protect your gear from the moisture. One zipped pocket might be not enough for some consumers. This is a perfect large gym bag for active people. The breathable material makes it a good fit for swimmers either. Perfect for storage of wet gear for it's got good ventilation. Honeycomb fabric is really attractive. 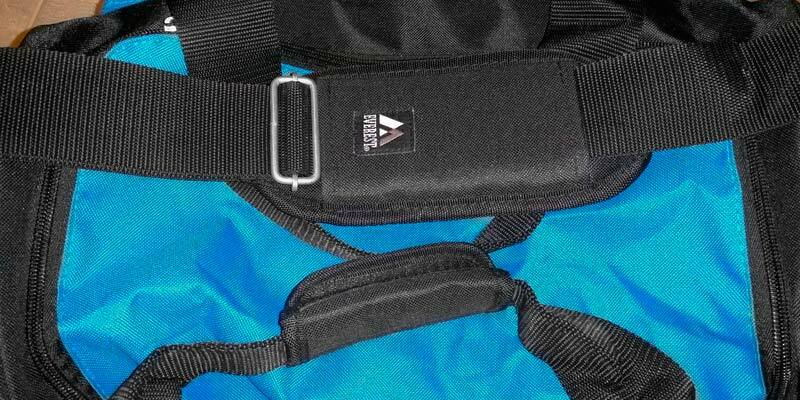 Shoulder strap is not padded. 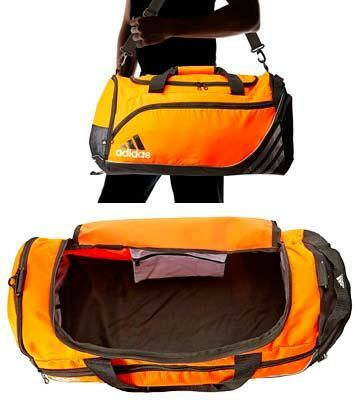 Bago duffel bag is extremely reliable and elastic sports bag. It also serves as a real airport savior as it can be unfolded to carry souvenirs while the soft fabric won't damage your fragile items. 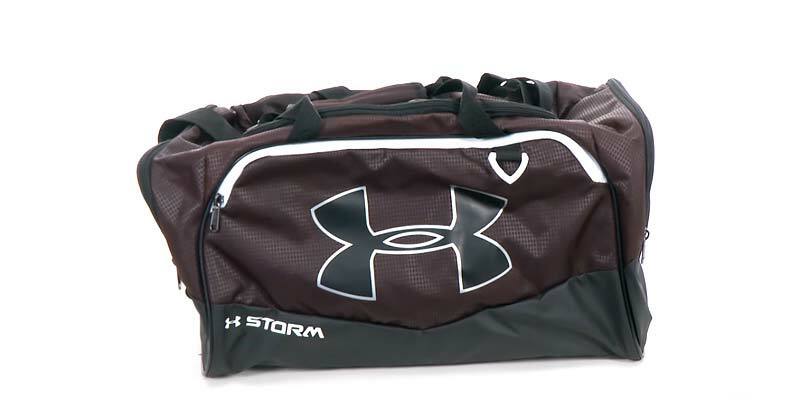 If you are looking for a super convenient duffle bag for all your sports gear, Under Armour sports bag is just what you need! It has a rectangular shape that makes it look fairly classy. The reviewed model comes in middle size, having the following dimensions: 25 x 13 x 11 inches. The volume of 3,700 cu. in. allows loading all your sports essentials and even some sports facilities like dumbells. This model is available in a variety of color options, so you can easily pick the one you like the most. You will definitely fall in love with this amazing gym bag as soon as you find out how convenient it is! 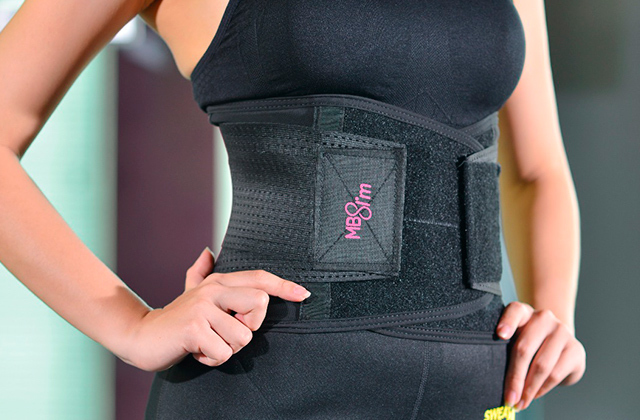 First of all, HeatGear® soft strap is adjustable and padded for the total comfort. An additional D-ring attachment is especially useful for keys or other small things as you will be able to get them quickly with no risk of dropping. The main compartment is really huge, allowing you to store all sports gear while side vented pockets are perfect for shoes and wet stuff. Also, the bag is fitted with a large front zippered organization pocket to stash your phone and other essentials. 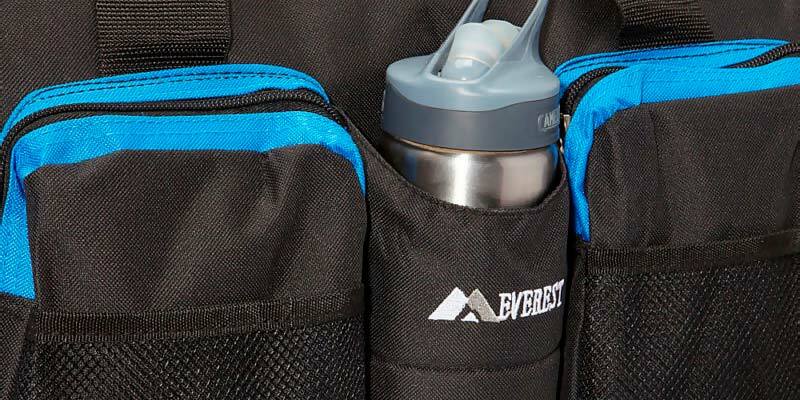 Everest Gym Bag with Wet Pocket is available in one size only. Having the dimensions of 18 x 11.5 x 10.5 inches, the bag has a standard slightly rounded rectangular shape. 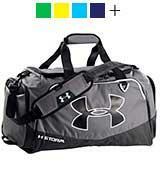 The overall capacity of this excellent gym bag is 1,950 cu. 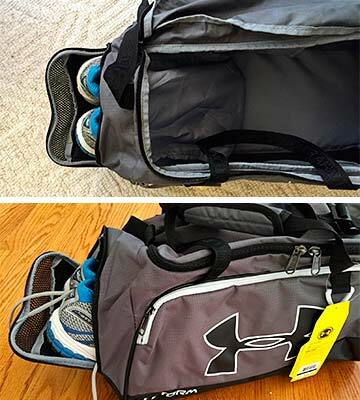 in., hence the bag easily holds all gym clothes, shoes, and other personal items. To sum up, with such design, dimensions, and tons of different pockets, this durable bag can hold everything you need for an intensive workout. Like most other top-notch sports bags, this one is made of 600D polyester. This material is quite strong and durable. Moreover, the fabric is also resistant to deformation. The bag weight is 2.8 lbs, which makes it a great option for heavy items and frequent use. It won't wear off after several months of use! The gym bag is available in 5 colors, mainly in dark shades. 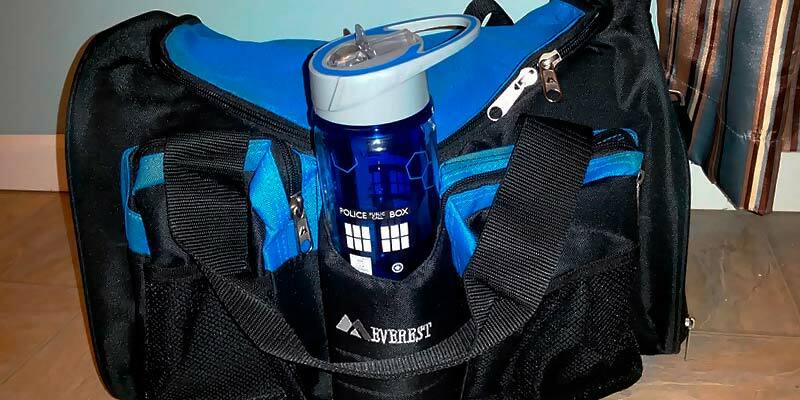 So, if you need a reliable bag for everyday workouts, buy Everest Gym Bag with Wet Pocket! 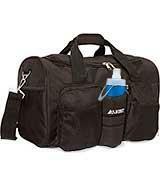 This duffle sports bag boasts two large front zippered pouches for small items, one special compartment, and a bottle holder between them. 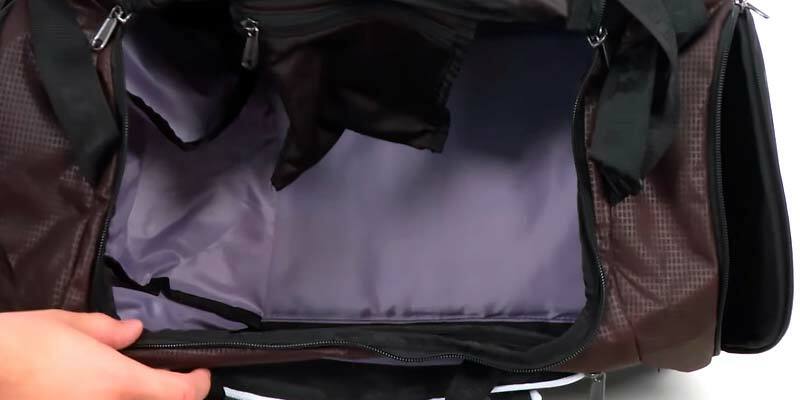 It also has a side pocket for shoes or other wet outfits, protecting the main compartment from unpleasant odors. Like other duffle bags, this model has two handles held together by a soft velcro. The manufacturer has also equipped the gym bag with an adjustable padded shoulder strap for a comfortable carrying. Great! 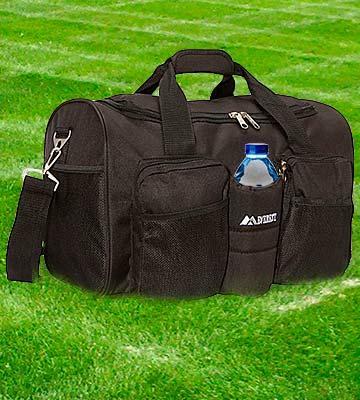 This awesome gym bag can become a great helper for all your family! 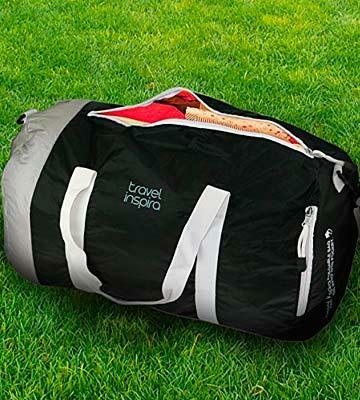 Travel Inspira Foldable Travel Sport Duffle Bag has a unique cylinder shape that looks stylish and original. The model under review is 17.9 x 11.3 x 10.5 inches. The volume is 2,440 cu. in., which is enough to carry all gym gear and some small sports equipment. A great benefit is that this bag is available in several size options - 1,400, 3,050, and 3,660 cu. in. 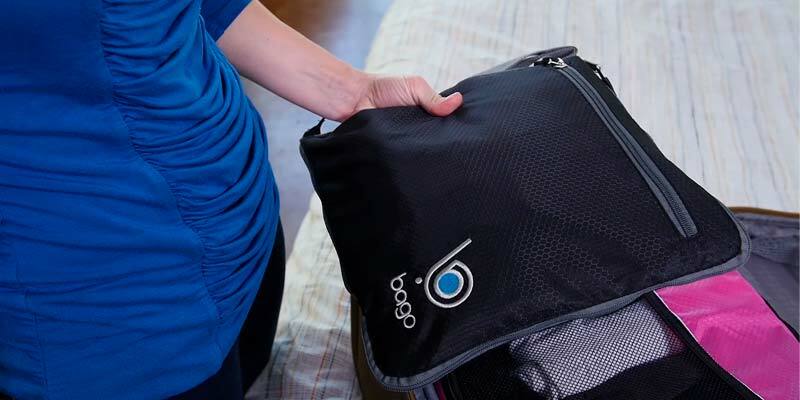 According to the feedback of the customers, this gym bag is also utterly convenient for traveling and spending days off on the river or the beach. 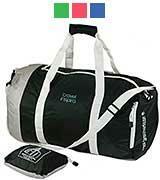 Travel Inspira Duffle bag is made of nylon (210D density). 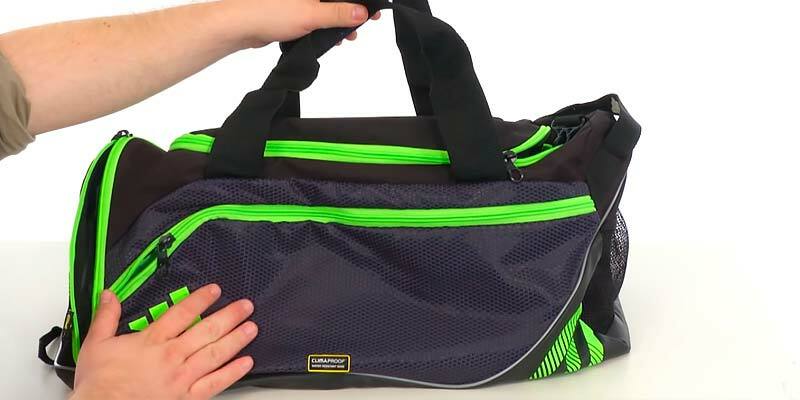 The material makes this gym bag super lightweight - it weighs only 0.5 lbs. But, despite its weight, the duffle bag is sufficiently spacious for all your gym essentials. The manufacturer claims that the fabric is totally water-resistant and thus, does not let the moisture in. The model is available in seven bright colors, so you will definitely choose the one to fit your personality! 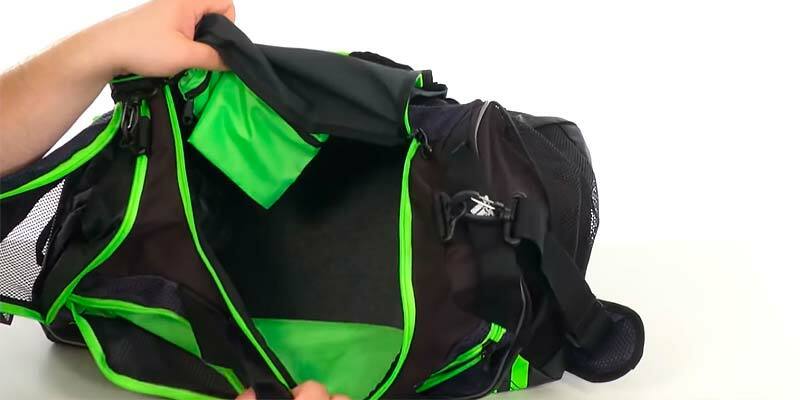 The feature that catapults this gym bag among its rivals is its super compactness. Just imagine! 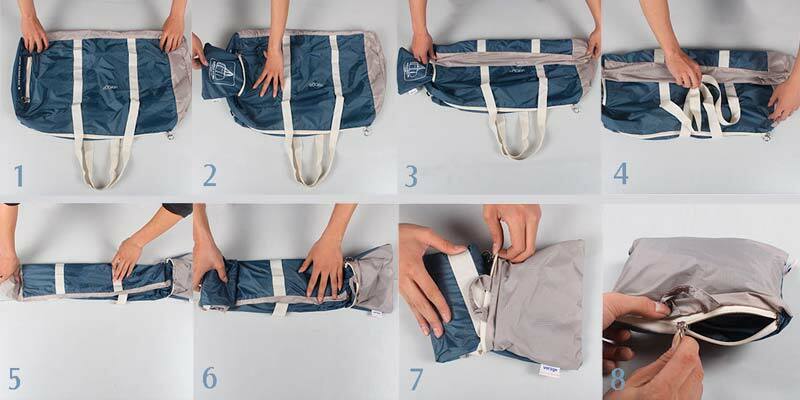 Once folded, the duffle bag takes only 2 x 4.9 inches; you can store it in a special little bag that is attached to it. And when the bag is in use, this little bag serves as a little side pocket for small items like keys, wallet, phone, and other valuables. 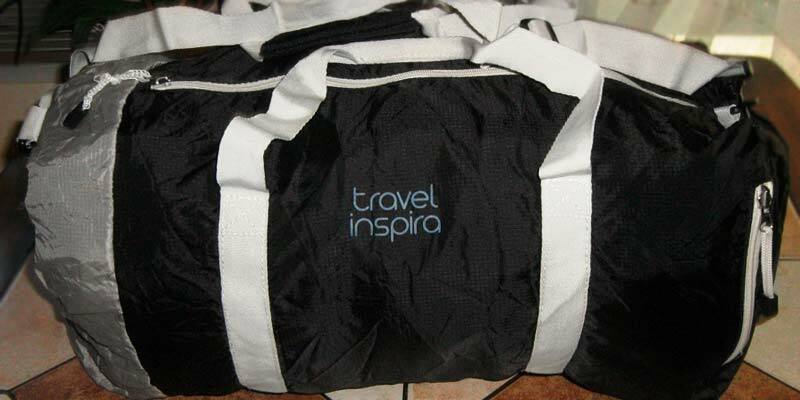 Travel Inspira bag also boasts a padded handle wrap with strong velcro, which is very comfortable for carrying. 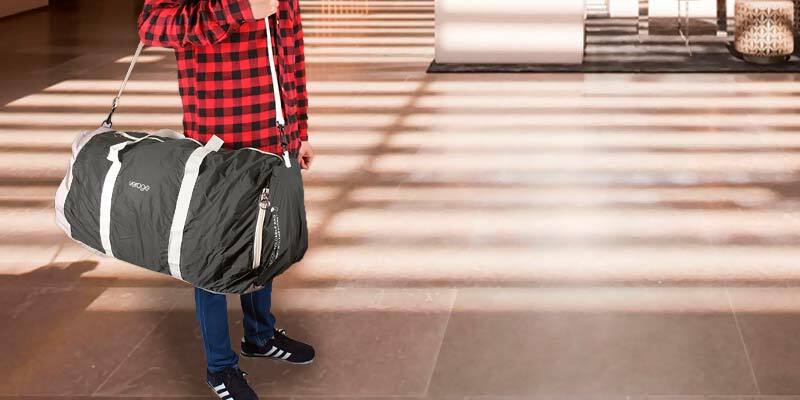 The Adidas Team Speed Small Duffel Bag has a pretty impressive size of 21 x 11 x 11 inches, allowing for carrying most of your sports equipment such as training costume, trainers and other sports accessories all in one bag. The bag has also got a spacious inner compartment for safe storage of valuables. A great duffle bag it is! This gym bag is made of 100% oval ripstop 600D polyester a durable polyurethane coating. The bag features a weaving of a strong thread by Rip Stop technology. It significantly increases the resistance of the material and hence, leaves no gaps. 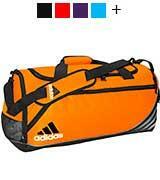 Furthermore, this Adidas bag is presented in a large range of colors. Thus, it can be one of the best gym bags for women. 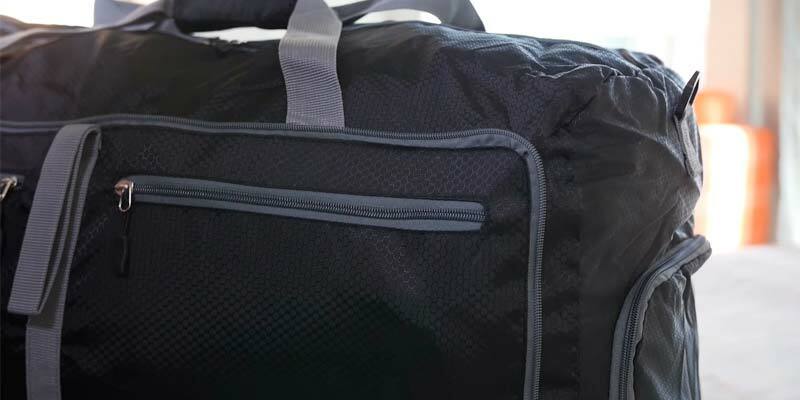 There is a special freshPAK ventilated compartment on the one side of this duffel for storage of wet, smelly sports gear. It's also made of waterproof material with a ClimaProof bottom for extra convenience. All your essentials will be protected from the wet and moisture, so you're safe to leave your bag even on the floor. Adidas gym bag has got an adjustable, mesh strap for convenient shoulder carrying. 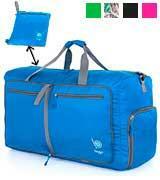 Bago Foldable duffle bag for gym comes in a bright compact design. With the size of 23 x 13 x 10 inches and the volume of 3,200 cu. in., it is perfect not only for the gym but also for trips. It has a rectangular shape and is paired with one side and two front pockets. This bag comes in 5 different colors and is also available in the 5,200 cu. in. volume, which is suitable even for the most demanding bodybuilders! 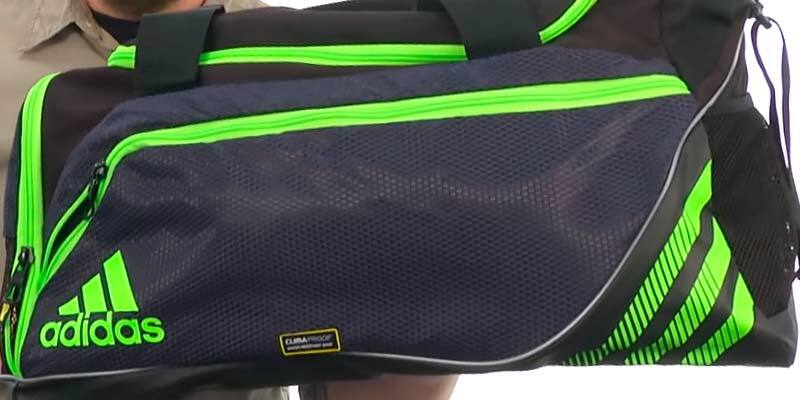 This gym bag looks nice and stylish due to its unique fabric. The bag is made of Honeycomb RipStop nylon that is also very durable and highly resistant to wear. The material is fairly elastic and moisture-resistant. 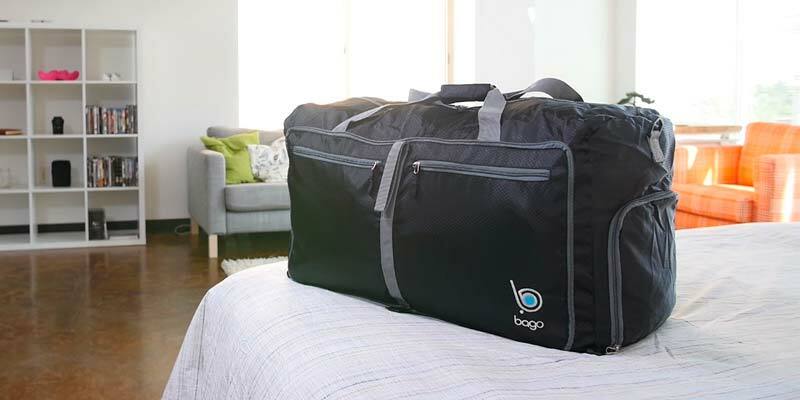 Bago duffle bag is fitted with a high-quality corded zipper and a water- and odor-resistant pocket for shoes or dirty laundry. All in all, with this fantastic bag, you will never face the problem of bad smell! 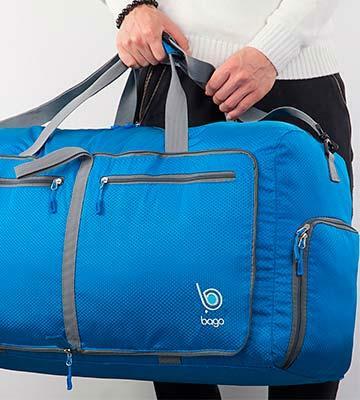 Bago gym bag is an ideal lightweight item with a huge inner compartment that can hold all your sports gear! As we have already mentioned, it also boasts a side pocket for shoes, 2 front pockets for small items, and an adjustable shoulder strap. But the main feature of this super versatile bag is that it can be folded up to a super small size: 10 x 11 inches. Hence, it is a great Just-In-Case bag. For example, it can be used as a shopping bag or as a "rescue bag" to avoid the overweight limit at the airport. Just fold it and put inside your carry bag! What Is a Gym Bag? As a rule, we all take some essential items for the workout at the sports gym. We may take a towel, toiletries, change clothes, deodorant, sports shoes and even some sports equipment. Thus, it is necessary to have a roomy sports bag. So, our review of the best gym bags will be in great use for the active people who prefer a sporty style. 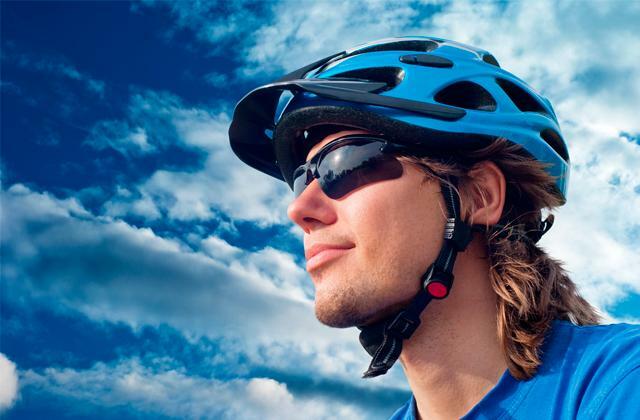 Do you lead an active and healthy lifestyle? If so, a fitness tracker might be a worthy purchase! 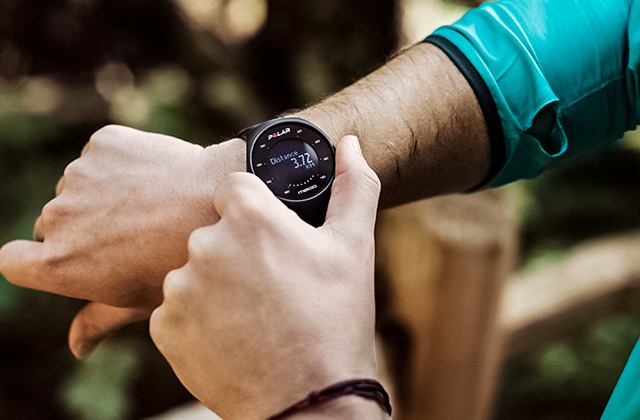 It can monitor your heart rate, count all the steps you make, calories burned, and more. Before choosing a bag, you need to define what workouts and sports activities it will serve for. First of all, you have to pay attention to its Size and Shape. 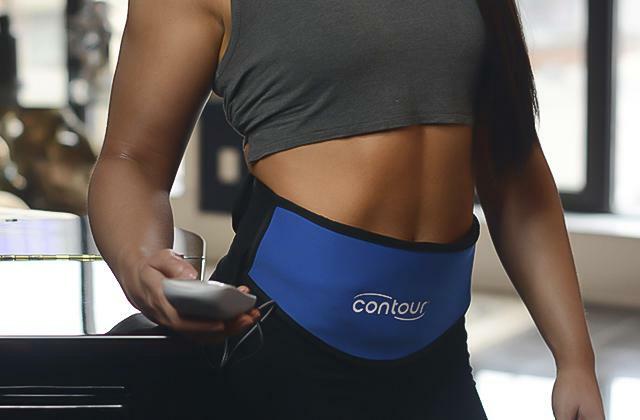 For example, the medium-sized bags are most likely to fit aerobics, yoga or jogging. These activities do not require many additional outfits. So, it is advisable to place your change clothes and towel into the middle-sized bag or into the light backpack. On the other hand, if you need to carry special sports clothes, different equipment and accessories, you should buy a larger bag. Moreover, if you train at the stadium, it is preferable to choose a bag with the large side pockets for shoes. Hence, they will not stain the other items. Another thing you should pay attention to is the Material. It should be not only lightweight and durable but also waterproof and breathable. Such material can prevent the odors that can appear while carrying wet clothes or towels. A good choice would be the bags made of impregnated polyester, which will not allow things to get wet during the rain. Additionally, such models are lighter and more resistant to deformations. Above all, we have one bag in our review that is made of leather. It is much stronger and does not leak. But, we would like to emphasize that its weight is significantly bigger. Finally, be sure to pay attention to the Features. For instance, the belts or straps should be strong and wide so as not to cause discomfort while carrying the bag on the shoulder. Waterproof pockets for wet things can be very convenient for those who go in for swimming. Vented or mesh compartments for shoes and inner pockets will also be a great benefit. 1. Christine Flammia The 9 Best Gym Bags For Men, Mens Health. January 19, 2016. 2. Barron Cuadro On Choosing an Appropriate Gym Bag, Effortless Gent. June 6, 2010. 3. 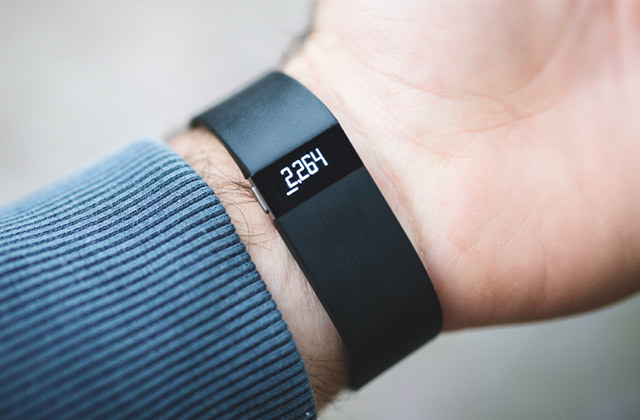 Kelsey Mulvey 12 Things Every Guy Should Carry in His Gym Bag, Business Insider. May 12, 2016. 4. Aj Powell 20 Gym Bags for Every Budget (and Workout), Gear Patrol. 5. Kate Dingwall The Best Bags For The Gym, The Idle Man. 6. Pippa Beiley 8 Best Gym Bags for Women, Independent. August 3, 2015. 7. Ian Nicholson, How to Choose the Best Duffle Bag, Outdoor Gear Lab. February 28, 2014. 8. Phil Diehl Buying Guide: Luggage, Travel Packs, Carry Ons and Duffel Bags, Eagle Creek. May 2, 2015. 9. 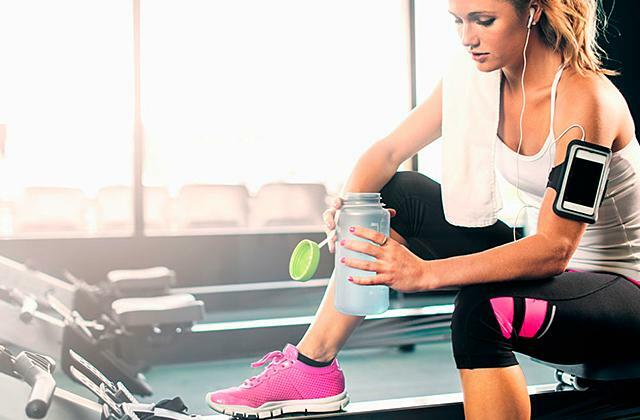 Shannon Clark Gym Essentials: 7 Items You Need In Your Gym Bag, Bodybuilding. December 18, 2015. 10. Amanda Waas GYM RAT: 20 BEST GYM BAGS FOR MEN, HiConsumption.